So, certain keyboard shortcuts have been ingrained in my brain through years of using Adobe products. Inevitably when transitioning to new design software, there are many more shortcuts to master to truly become efficient. For instance – in Keynote, every time I wanted to zoom in and out of the page I’d automatically reach for cmd +/-. Nope. Hmm, that’s odd. I’d keep tapping, then smashing the keyboard frantically to see if it would work. Keynote says no. Sound familiar? Well, here is my gift to you – mildly annoyed designer. 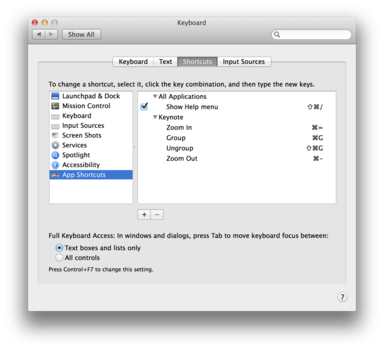 How to Adobe-ify your keyboard shortcuts to truly design in Keynote like a boss. Go to System Preferences, Keyboard and then Shortcuts. Inside the panel on the left is an area for App Shortcuts. Once there, press the + button and you can change the keyboard shortcuts in Keynote to whatever the hell you want! Well, it blew my mind anyway. I’ve also swapped out the shortcuts for grouping objects too. I’m sure there are many more you could change to help you transition to keynote and speed up your work flow. Through the use of visual and interaction design, I continually balance customer needs with business requirements. I believe in user-centred design, rapidly testing assumptions early and often to help bring new digital products to market.